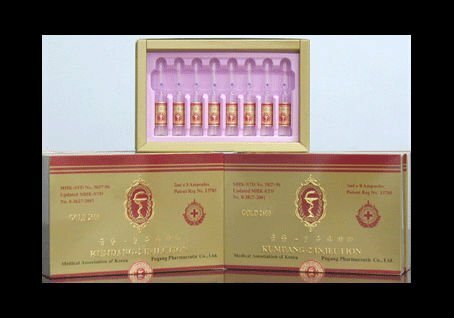 1) Kumdang-2 Injection is a traditional oriental herbal medicament extracted from the famous Kaesong Koryo ginseng skillfully cultivated and enriched by micro-elementary fertilizers. 2) During its injecting and thereafter, you would feel no pain at all at the injected part of your body. 3) Unlike the chemical medicines, it is devoid of any side-effects or adverse consequences. - It never affects in the least the liver, stomach, heart and other intestines. On the contrary, it helps to cure or strengthen them. - It never causes such side-effects as dizziness, nausea, headache, indigestion, cough, etc. Some patients may feel slightly drowsy, but to a hardly noticeable extent. - The stimulant feelings in the diseased part are interpreted as signs of healing. 4) No contra-indications are recommendable and it may be applied together with any other medicines. 5) It is characterized by satisfactory multi-functions covering the following 3 categories. 6) It absorbs or removes all kinds of pathological growths and diseased tissues irrespective of their distinctions whether heterogeneous or homogeneous to the healthy ones, e.g. in some cases of polyps and skin disorders, the diseased parts consist of tissues homogeneous to healthy ones, but this injection successfully cures them. 7) Different patients differ from one another in terms of time and duration of cure, i.e. it is hardly possible to tell in advance in each case when the active healing process would start in the human body and how long it would take before complete cure. 8) Injecting Kumdang-2 every 6 hours, 5 ampoules each time for 1-2 days would result in complete cure of any kind of flue and cold including New Flue. 9) Whenever you take any kind of antibiotic it should be compulsory to simultaneously use this injection to prevent damages of liver, stomach, etc. Insomnia, low blood pressure, various cancers, vegetosis, arthritis. etc.